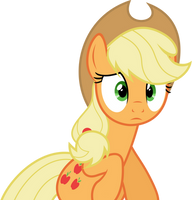 Applejack time! She was pretty fun to draw and it took less fooling around to do the crystal effect this time. There are four versions of her: With her hat and the salad hair accessory as well as with and without the crystal effect. As with Pinkie, in the show, the pony itself has about 80-90% opacity, something to keep in mind if you want to use her for anything. There are also some other fancy filters on the pony and some sparkles. Feel free to use this if you want, just link back to this page if you do, please. UPDATE Changed the archive to separate images. My Little Pony: Friendship is Magic belongs to Lauren Faust, DHX Media Vancouver, Hasbro and Top Draw Studios. how did I become crystal after all? If crystal lasts for longer than four hours, you should contact medical help. Well, they're all the same trace, the reason you might not find it is because she was looking upwards towards her salad hat in that frame, I changed it a bit so it's more usable. She has a really pretty mane style like this, but realistically I doubt she'd like having her hair so neat in her daily life. It's not like her. yeah I that makes sense. I guess leave well enough of alone. Are you also gonna do Twilight Sparkle, Rainbow Dash, Rarity, Fluttershy and Princess Cadance? I will do the mane 6 and maybe some secondary/background characters after, depending on demand. I'm taking a break from them for now though. Yeah, she really is a looker. All so crystally and stuff! Maybe I should let YOU decide! Dang straight, Pirill. Excellent work! I hate you for the title and love you for the vectors at the same time. NEVER! I will never stop until I have all your jimmies. Fundz has them, not me. Then I shall have all of his jimmies and yours combined! Sorry to break your evil plotting... but I already sold mine to Crystal Vinyl Scratch! You'll have to get Paxx's and mine through her! Darn it! The endless quest for jimmies continues. You're the Grandmaster planner of evil plans! Recently time , I adore all of the crystals and all crystalline!